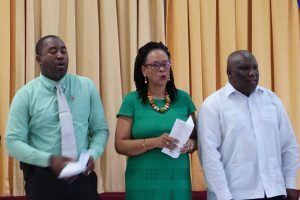 THE MINISTER OF Education has thanked two ‘stalwarts’ of the education sector as they leave with, together, a service period to the Ministry of over 75 years. 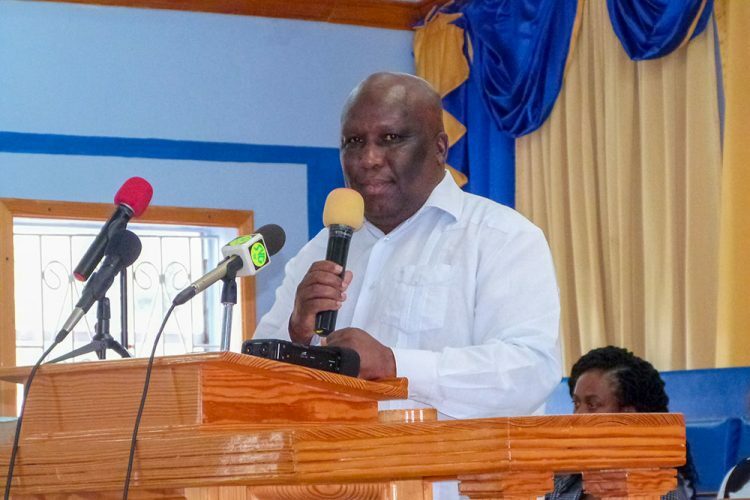 St Clair ‘Jimmy’ Prince, Minister of Education briefly addressed the packed New Testament Church of God at Wilson Hill yesterday morning, at the beginning of the Ministry’s Annual Thanksgiving Service. “I’m talking about the Permanent Secretary Mrs Morine Williams, and the former Chief Education Officer, Miss Beverly Neptune. They have retired now, or they are retiring,” he stated. (see story on back page) “I’d like to thank them. I benefited from their counsel, from their vision and I wish them all the best,” Prince revealed. “They have given us in aggregate over 75 years of contribution to the Education sector, and we thank them for it,” he informed. 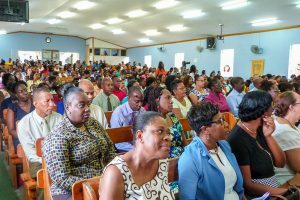 The new Permanent Secretary to the Ministry of Education, Myccle Burke, and the acting Chief Education Officer, Elizabeth Walker, were both formally introduced at the ceremony to the educators and students lining the pews. With the theme of the ceremony being, “reflect, rejoice, give thanks,” the Minister said it was important for them to contemplate on their strengths as well as weaknesses. “We ought to correct weaknesses, and we ought to build our strengths so that we can deepen and widen the particular enterprise in which we find ourselves,” he mused. “We are mostly people of faith in St Vincent and the Grenadines, and we accept that we need the guidance of God in our lives, but while we do faith, we have to do works also,” he encouraged those present. “At the end of a period, the persons leaving school… Did you build character? Did you instill morals? Did you inculcate a sense of citizenship, and patriotism, etc? These are the works I’m talking about that we need as educators to deal with,” he clarified.